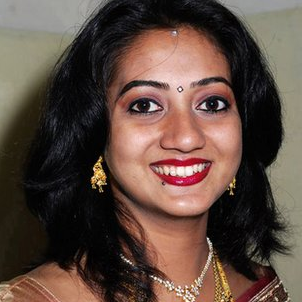 Ireland’s inquest into the death last October of the 31-year-old Indian dentist Savita Halappanavar in Galway University Hospital has shown that she died not as a result of being denied an abortion but of an undiagnosed three-day-old sepsis. 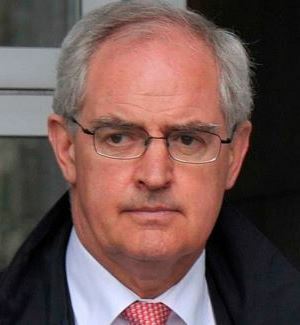 Both latch exclusively onto the expert evidence given by Dr Peter Boylan, an obstetrician who suggested that had Savita had a termination her life might have been saved; but the evidence of the other experts pointed overwhelmingly against that conclusion, which is why the jury accepted the coroner’s verdict of “medical misadventure”, and the nine recommendations which followed — all relating to systems and procedures. If is indeed true that a termination could have saved Savita’s life, could it have taken place under Irish law? The answer is yes — if it were clear that the pregnancy posed a risk to the life of the mother. But in such cases it is not usually clear (until too late) that a pregnancy poses such a threat, and what determines a clinical decision at that point is not the law but best-interest judgements. You’d think, from what O’Toole and Gold claim, that mothers would often be dying in Ireland when abortions could have saved them. But the opposite is true. A higher percentage of women die in the UK from complications in childbirth than in Ireland. Savita’s death from septicaemia, a week after being admitted to hospital in her 17th week of pregnancy and apparently miscarrying, has elements of scandal — what has come to light is a series of oversights, miscommunications, and errors — but Irish abortion law is not one of them. As CV Caroline Farrow has outlined at Mercator, the various testimonies in the inquest confirm the general picture painted in February after Ireland’s Evening Herald published leaks from the investigation by Ireland’s Health Service Executive. The February leaks clearly pointed to Savita’s tragic death being the result of a single mistake made on the day she was admitted. Doctors failed to follow up blood test results which indicated that Savita may have been fighting an infection. Drawing from the HSE leaks, the Herald stated that the most likely cause of Savita’s miscarriage was infection, and that Savita was suffering from sepsis for three days before it was diagnosed. Contrary to what he originally told the Irish Times, Savita’s husband Praveen confirmed that the Halappanavars had been informed not that Savita was fully dilated when she was admitted to hospital, but that there was only some cervical dilation. Dr Andrew Gaolebale, who dealt with the Halappanavars on Sunday afternoon, denies telling the couple that it would all be over in four or five hours, and that they could go home afterwards. Dr Katherine Astbury, the consultant who took charge of Savita’s case, denies that Savita asked for a termination on Monday 22 October. Had Savita done so, said Dr Astbury, she would not at that point have needed to seek a second opinion in rejecting such a request, given that there was nothing pointing to her life being in danger. Dr Astbury also denies that she justified her Tuesday 23 October refusal to terminate Savita’s pregnancy on the basis that Ireland “is a Catholic country”; this has been supported by a junior doctor who was present during that conversation. The inquest has established that Praveen was not present for the 23 October request he had claimed to have witnessed, as he spent that morning driving to and returning from Dublin airport. The inquest has also established it was a midwife, Ms Ann Maria Burke, who made the comment about Irish Catholicism some three hours after Dr Astbury refused the termination; and did so as part of a broader conversation about cultural differences between India and Ireland. The inquest established that neither on Tuesday night nor the early hours of Wednesday morning did Savita vomit and collapse in the bathroom, with a doctor taking a blood sample and starting her on antibiotics; Praveen seems to have conflated Savita’s need for a blanket around 4:35am on Wednesday with events after midnight on Monday when her membranes spontaneously ruptured. The inquest established that rather than being started on antibiotics on Tuesday night as Praveen originally claimed, or on Sunday night as he claimed in an Irish Times audio interview, or on Tuesday morning as he said at the inquest, Savita was started on antibiotics on Monday morning as a preventative measure. 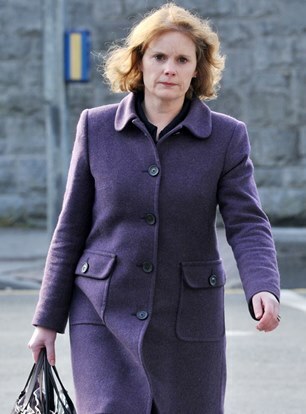 Dr Astbury says that she does not recall Praveen requesting a termination for Savita on Wednesday morning. 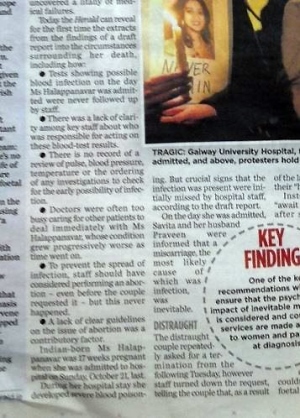 On that morning, she told Savita that they might soon have to consider a termination (“I also informed Ms Halappanavar that if we did not identify another source of infection or if she did not continue to improve we might have no option but to consider a termination regardless of the foetal heart.”) In the end, the baby died in the womb; and Savita died a few days later. It is worth comparing the timeline published in the Irish Times on Saturday 24 November with the chronological outline of events as recounted by the coroner, Dr Ciaran MacLoughlin, at the official inquest. O’Toole’s Guardian piece claims that Savita’s medical team acted to terminate her pregnancy only when her sepsis was life threatening; the inquest showed, rather, that they acted when they realised her sepsis was life threatening. By failing to follow up blood tests conducted on Sunday, they had no idea of how serious her situation was until Wednesday morning. Savita’s situation was life-threatening long before the medical team took action. O’Toole says Savita sought a termination knowing that her foetus could not survive, and discusses Medical Council guidelines for when the foetus is unviable; yet Dr Astbury, the obstetrician in charge of Savita’s case, and Dr Boylan, who acted as an expert witness at the inquest, both said the child had a small but significant chance of coming to term; and according to Dr Michael Tan Chien Shang, Galway’s histopathologist, the baby had been perfectly healthy. Dr Irene Gafson, writing in the Telegraph, also took issue with what she regarded as the hospital’s disregard for Savita’s autonomy when she requested a termination to help her clinical condition. But Savita wasn’t seeking to improve her clinical condition; she was asking to be relieved of immense emotional strain. Galway’s staff were sympathetic, but they were also aware that to have attempted a termination of a healthy baby that posed no risk to the life of its mother would have been not only illegal but dangerous. As Dr David Walsh, a Dublin-based obstetrician, explained last November on Ireland’s Tonight with Vincent Browne, intervention is not a risk-free activity. “Dr Peter Boylan, the obstetrician giving evidence to the inquest, believes that had Halappanavar received the abortion she requested, she would not have died. Last week the coroner ruled medical misadventure – how could he do anything else? But the coroner did not rule “medical misadventure”. He gave the inquest’s jury a choice between medical misadventure or a narrative verdict — meaning, an account of what happened which didn’t fit an obvious category. A narrative verdict would have allowed them to agree with Dr Boylan’s opinion that an early termination would have saved Savita and that the law was at fault. But after reviewing the evidence they rejected this option. The coroner’s nine recommendations accepted by the jury did not include (pace Gold) a call for the the Irish law on abortion to be clarified. The inquest was not empowered to make such a recommendation — though had it opted for a narrative verdict, it could have accepted Dr Boylan’s analysis that the law was at fault. Rather, the inquest recommended that the medical council clarify its guidelines on what constituted real and substantive risks to mothers. Ireland’s Pro-Life Campaign has welcomed this recommendation, as it did all the others. Dr Boylan, who says Irish abortion law is to blame, was not the obstetrician who had care of Savita; nor was he the only expert witness. Because it fits the early narrative that Savita ‘died because she was refused an abortion’, his has been the loudest medical voice heard since the inquest. But it is striking how the other doctors involved in this case, either as clinicians directly concerned for Savita’s care or as expert witnesses, ascribe to the hospital’s failures the key reasons for her death. Dr Susan Knowles, for instance, a consultant microbiologist from Dublin’s National Maternity Hospital and another expert witness at the inquest, was far more critical of the hospital’s many failures: she says the original blood tests (which would have shown infection) should have been followed up; she points out the many subtle indicators that Savita had sepsis and chorioamnionitis on Tuesday; and she took issue with how matters were handled on Wednesday. Dr Astbury also gives more weight to the failure to follow up the Sunday blood test than Dr Boylan, saying that had she been aware of the results, she might have moved to accelerate Savita’s miscarriage sooner. (Presumably Dr Astbury does not mean that she would have done so immediately, but rather that she would have begun tests to examine whether Savita was more ill than she appeared, and acted on that.) Gold’s silly parody of this evidence — “This is too like the trials of the ancient witches: if they drowned, they were innocent” — tell us more about her world-view than that of the Galway doctors. Even before the inquest, it was clear that nothing in Catholic teaching had barred the staff at Galway University Hospital from taking action to save Savita’s life. As a result of the inquest, it should be clear now that nothing in Irish law did so either. When O’Toole begins her article saying that Savita “died after being denied an emergency termination in October” she is helping to embed a narrative that is highly misleading. People die after drinking cups of tea, but that does not make the tea the cause of their death. Savita died not because she was refused a termination that would have saved her life, but because of an untreated septic shock caused by an antiobiotic-resistant e.coli infection. The reason doctors did not consider accelerating her miscarriage before Wednesday was because she appeared to be healthy and her baby was alive. There are those — Gold and O’Toole among them — who will continue to believe that to refuse a request to kill a child in the womb for this reason is “barbaric” and “medieval”. Others will think that to accede to such a request deserves those adjectives. That is a philosophical disagreement. But Gold and O’Toole should make their case against Ireland’s abortion laws on the grounds of autonomy, convenience and ‘choice’, and not to continue to claim, spuriously and dishonestly, that health has anything to do with it — or, worse, that Savita died because of pro-life laws. Her tragic death deserves better. This entry was posted in abortion, Uncategorized. Bookmark the permalink.